This is a versatile dish. You can use ground turkey, sausage, or any other meat. Also feel free to add or change the veggies in the recipe. I always make extra and then freeze the leftover stuffing mixture. Next time, experiment with stuffing portabello mushrooms, zucchini, squash or cabbage. In a large skillet, heat oil over medium high and add garlic and meat. Cook meat until it is no longer pink. Remove from stove. Drain any extra fat. Add carrots, scallions, and rice or quinoa. Add garlic salt. Stir well and add spinach last. Arrange peppers, cut side up, in a baking dish or pan that fits all the peppers. Divide the rice mixture among the peppers. Add about ½ cup water to the dish bottom, tightly cover the dish with foil, and bake until the peppers are soft, about 35 minutes. Uncover, sprinkle cheese on top and bake until melted, about 5 minutes more. 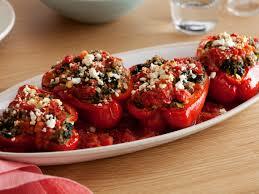 Notes: Peppers can be stuffed up to 12 hrs in advance, refrigerated – just add 5-10 minutes to the baking time. ← Alcohol or Sweet Cravings at Night? This looks very delicious. I am going to try cooking it in my crock pot with the quinoa instead of the rice and Use black beans instead of the chicken.